A taciturn New Englander, Coolidge was not the typical outgoing American politician. He served in Massachusetts politics, becoming governor in 1918. His hard line against striking Boston police officers (“There is no right to strike against the public safety by anybody, anywhere, any time.”) gained him national prominence and selection as Warren G. Harding’s running mate in the presidential elections of 1920. 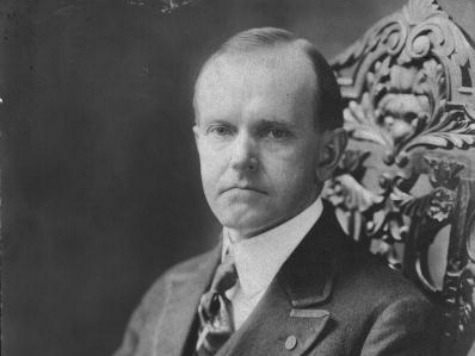 When Harding died in office in 1923, Coolidge stepped in and did much to clean out the corruption that had characterized that administration and rebuilt American confidence in the presidency. Despite his tight-lipped approach —“Silent Cal,” he was called—Coolidge won election in his own right in 1924.